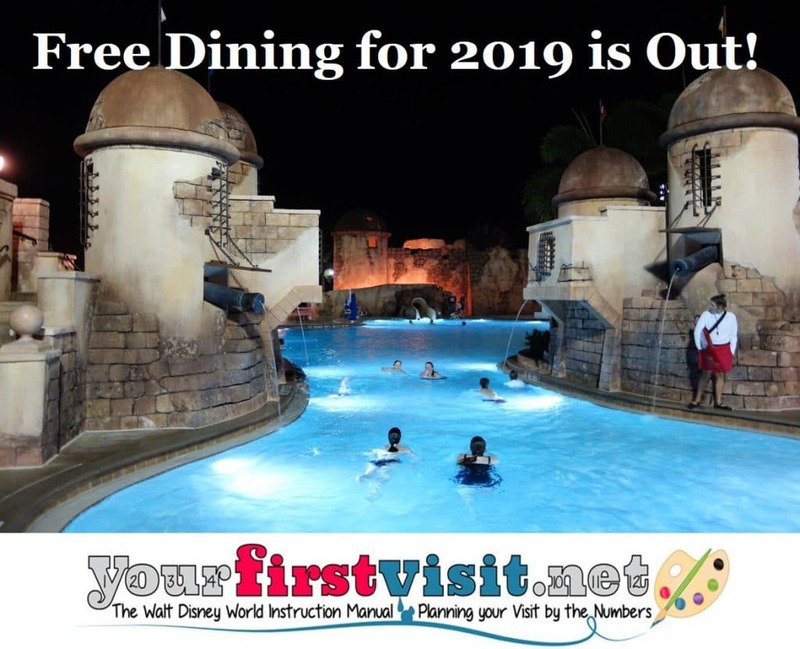 Free Dining for 2019 is Out! 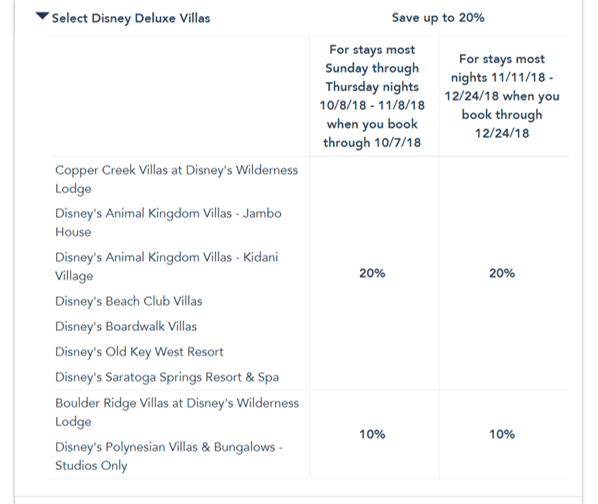 Two new Disney World deals came out this morning. 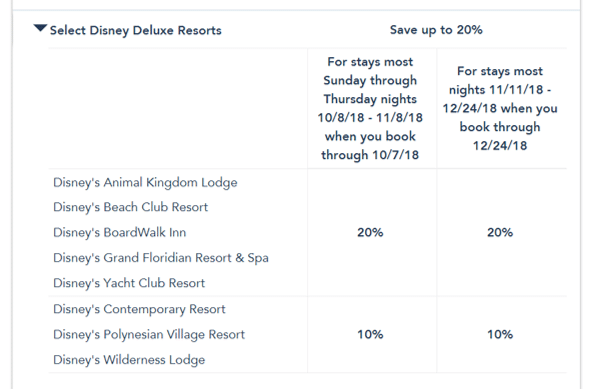 One is a room-only discount and the other is Free Dining—the best-loved Disney world deal, out months before it usually is, and covering a longer period in the summer, but no dates—as of today—after September. 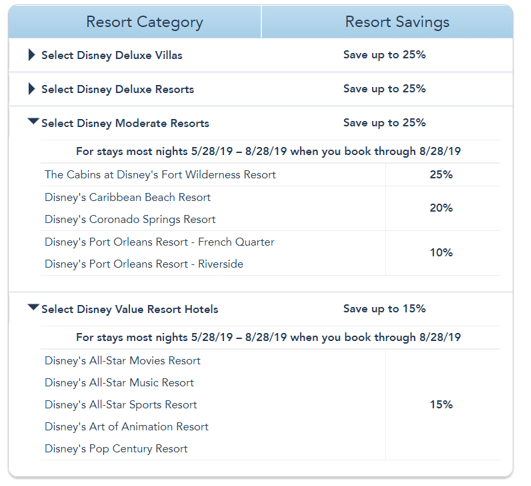 Dining Plan (Disney Quick-Service Dining Plan with Value and Moderate Resort hotel packages; Disney Dining Plan with Deluxe and Deluxe Villa Resort hotel packages), which you will then get for free. 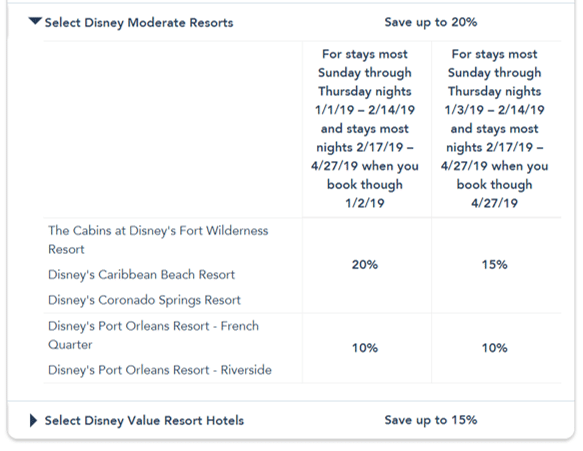 Among the hotels/rooms excluded from the free dining deal are Little Mermaid rooms at Art of Animation, All-Star Movies, Coronado Springs, Port Orleans French Quarter, and DVC rooms at Bay Lake Tower and the Villas at the Grand Floridian. More on this deal is here. Many families do great with the free dining deal, but smaller families in more expensive hotels should compare the room-only deal, as it may be the better choice. See this for more–it’s out of date, but still explains most of the key concepts and savings. The long standing travel agent partner of the site, Kelly, can book your vacation, and figure out the best deal for you! Contact her using the form below. Late last week my buddy Steve Bell reported that the Disney Military Salute has been renewed for 2019, and eligible dates (not all the block-out dates are out yet) extend well into December 2019, to December 19, 2019, similar to the 2018 salute. The long duration of eligible dates in 2019 was a bit of a surprise, as there was a school of thought that an early end (e.g. September 30) would create more room for full-paying Star Wars folk once it opens in late fall 2019. So either DIsney is intentionally not giving away it’s Star Wars opening date through the timing of this dela; by late fall opening of Galaxy’s it really means late fall (one definition of fall has it ending December 21, 2019); or–and this is perhaps most likely–one part of DIsney is not talking to the other. As always, the best source of info on the Armed Forces Salute deal–the best Disney World deal out there, serving the best set of people in the world–is available on Steve’s MilitaryDisneyTips.com. Start with his info on the Armed Forces Salute renewal for 2019 here. Multiple sites are reporting that our long dining nightmare at Disney’s Caribbean Beach Resort will be coming to an end next week. While I have not yet seen anything official from Disney, lunch and dinner reservations at the new waterside table service, Sebastian’s Bistro, are available beginning October 8. Other changes that may or may not happen then are the reopening of a redone gift shop and counter service area, the shift of check-in from the Custom House to the same main central building in Centertown where the gift shop and counter service will be found, and the shift of the entrance road from Buena Vista Drive to Victory Way. Also reported is that Trinidad South will be changing its name to Barbados, and Trinidad North to simply Trinidad. In the longer term this name change, if it happens, will be a great move, especially for the dyslexic like me, but in the short term it will replace one set of confusions with another. While I was caught up in my day job—I just started up with a new strategy and management client, and it’s a lot of work to get it off the ground—a new Disney World deal came out, and another had its “book-by” date extended. 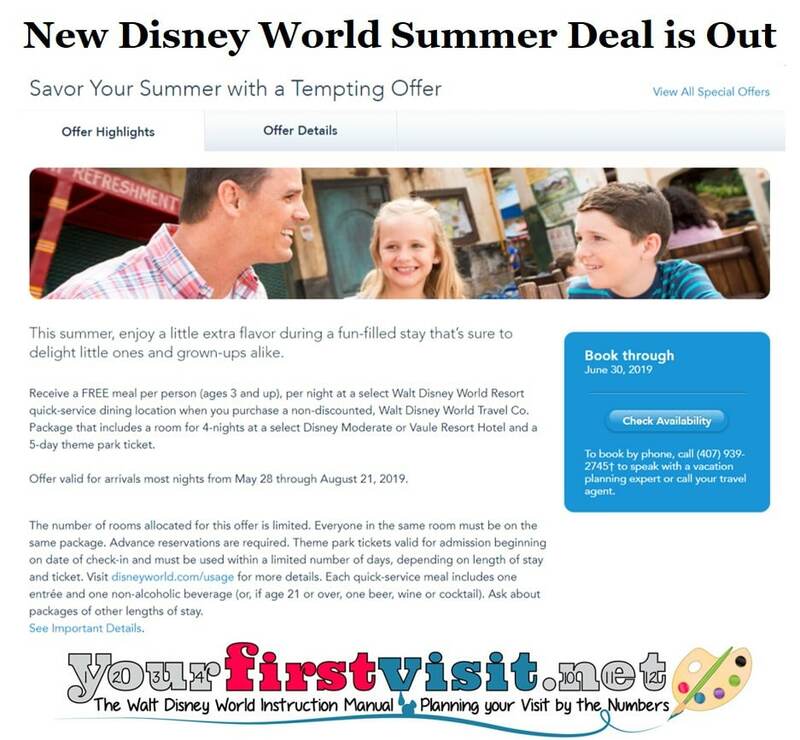 First, before getting into the details of the new deal—the “book-by” date for Disney’s popular Free Dining promotion has been extended to August 1, from its former July 7. The new deal is a room-only discount that comes in two parts. 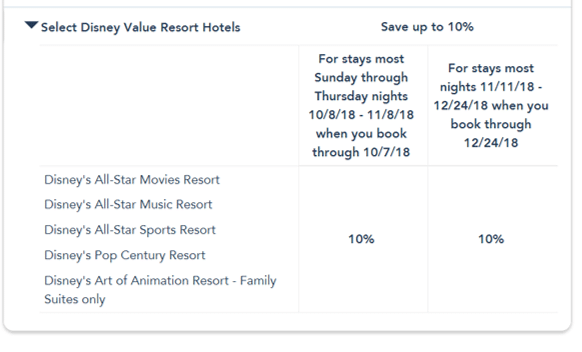 For stays booked by October 7 that include stay dates October 8 through November 8, the discount applies to “most” Sunday through Thursday nights—that is, Fridays and Saturdays are not discounted. 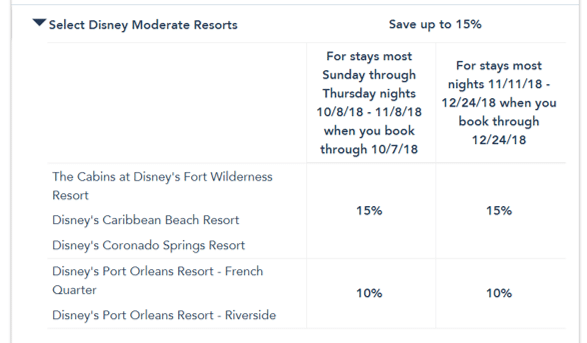 For stays booked by December 24 that include stay dates November 11 through December 24, the discount applies “most” nights—that is, Fridays and Saturdays are not explicitly excluded. No resort is totally excluded, but at Art of Animation, as usual only Family Suites are included. No moderates are excluded, but the deal is less valuable at Port Orleans Riverside and Port Orleans French Quarter. 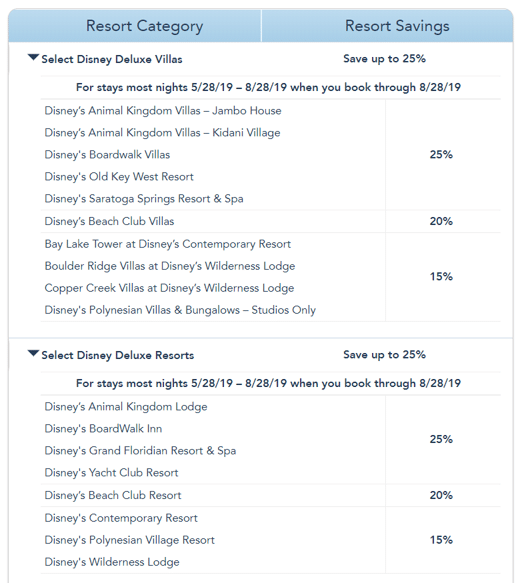 No deluxe is excluded, but you will find not as good a discount at the Polynesian Village, Contemporary Resort, and Wilderness Lodge. 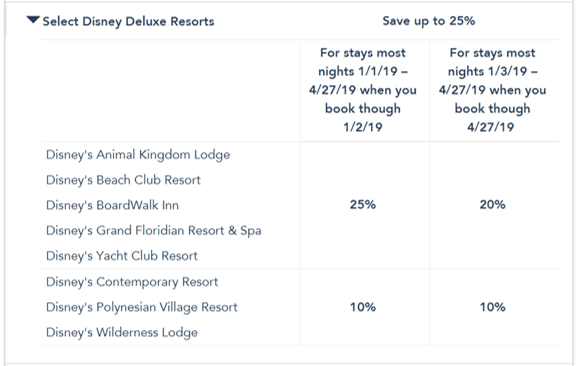 At the DVC resorts, the Villas at the Grand Floridian and Bay Lake Tower are excluded, and at the Polynesian Village only the Studios are in the deal. 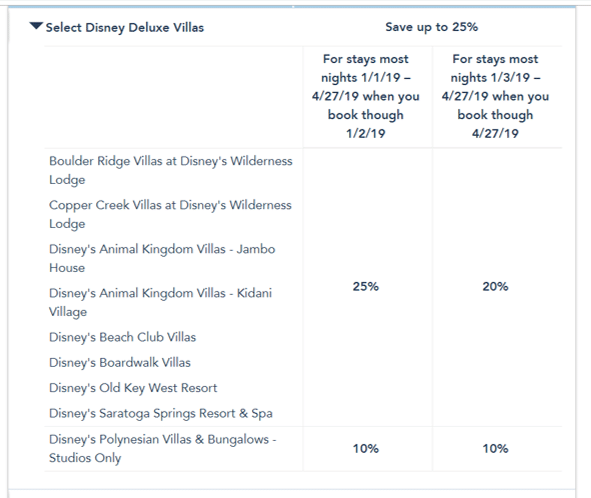 Moreover, among those in the deal, the Polynesian studios and Boulder Ridge at the Wilderness Lodge (but not Copper Creek there) are at a lower discount. 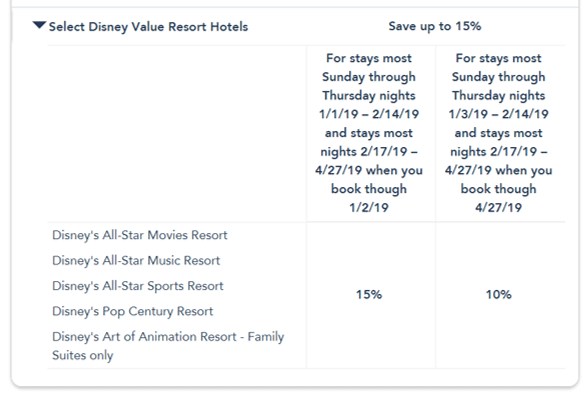 Go to Disney World’s pages on these deals– here for the room rate deal, or here for Free Dining.